Jackie Maloney is an illustrator based in Hampton Bays, NY. Her whimsical & often humorous illustrations are inspired by her love of the beach, fresh food & spending time outside. 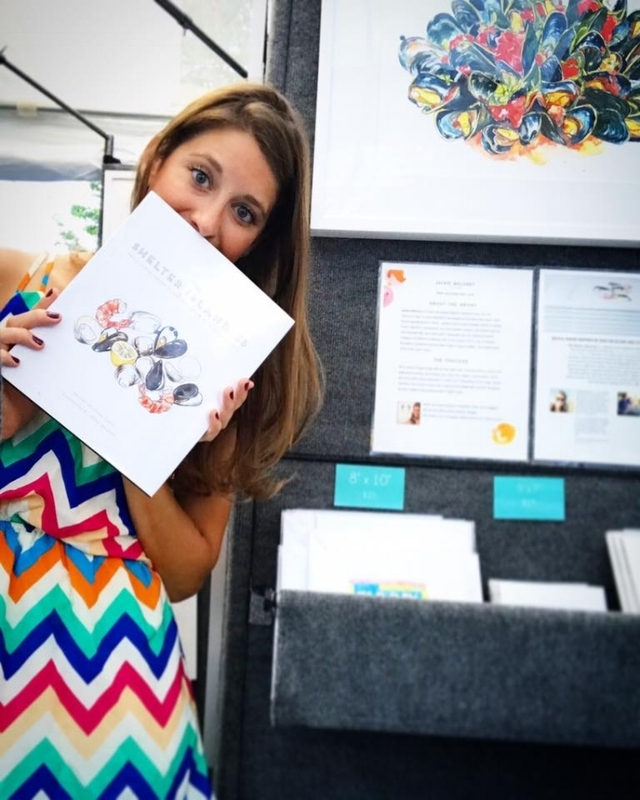 In the spring of 2015, she completed illustrating a cookbook featuring New England recipes titled, The Shelter Island 36 by Chef Jason Casey. She is available for editorial and publishing illustration projects, art licensing and private commissions. Jackie can be found exhibiting at many art festivals throughout the East Coast. Jackie also enjoys beach days, puns, and snuggling with her furry studio assistant, Cole the Cat. Feel free to contact her with your project. Edible East End, EAST Magazine, Chesapeake Bay Magazine, LOCAL Life Magazine, Bethesda Magazine, Hamptons Wine Shoppe w/ Jamesport Vineyards, Edible Long Island, Kitchen Table Magazine, The Clever Designer, Hilton Head Island Seafood Festival, North Fork Oysters, The Safe Center LI, Richmond Hill Reflections, Cornell Cooperative Extension Marine Program, Greenlife Luxury Homes, Peconic Land Trust, The Weathered Barn, Women's Adventure Magazine, Baltimore City Paper, etc. Read Jackie's Hamptons Monthly Artist Spotlight interview here. Get your copy of The Shelter Island 36 here.